This was Niko’s first time enjoying the view from his stroller as he was meant to: sitting up and looking forward (despite the fact that his straps are a little loose). Up until now he’s been cruising in his car seat: looking skyward with the seat clipped into the stroller. But at six months he seems ready for the new view and this easy access to his toys! Niko is now learning or doing something new everyday. Among other “milestones”, shrieking seems to tickle his fancy and reigns high at the top of his daily to-do list. Mommy: What a beautiful voice you have Niko! 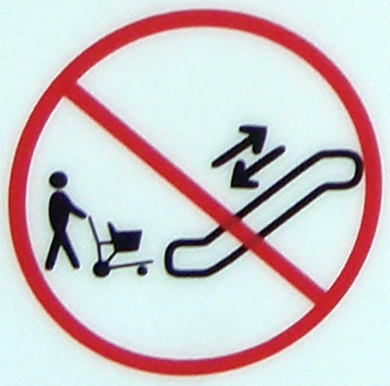 Shopping with a stroller in a multi-leveled (not to mention super busy) mall brings a whole new meaning to navigating your way around. Yesterday afternoon we headed down the big bad Rideau Centre: a mall with three floors and tonnes of shops. I for one am not big on shopping, especially in the mall, but Gramma had a few things she wanted to get done, so downtown we headed. And as always, being a (semi :)) new mom and out and about with baby N in an new environment, I learned a thing or two. First off, for convenience sake, we needed to locate the elevator, which by the way was out of order. How convenient. Elevator? Did I even think about an elevator in the pre-Niko days? No. Even though the elevator was out of order we were redirected to another one, but we couldn’t find it and ended up using the one in the Westin. Which in the end brought us outside, to one of the busiest intersections in Ottawa: the corner of Rideau and Sussex. No, it was not the most efficient way to get around, but then again having a baby in tow sort of puts the brakes on efficiency in general, so I guess that was to be expected. And even putting up with the exhaust filled (but sunny) air at the corner of Rideau and Sussex was more appealing to me than making my way as a mall rat in the enclosed shopping centre. 1) Went the Rideau Centre (and survived)? Check! 2) Found the conveniences of ramps and elevators (despite one of them being out of order)? Check! 3) Maintained my sanity and lived to tell the tale? Check! 1) When Niko and I were in the Halifax airport I was feeling sort of like a packhorse. Envision one mom, two large gym bags (one crisscrossed over each shoulder), and a diaper bag to boot, while one hand pushes the stroller ahead and the other one pulls along my suitcase behind us (thank goodness it had wheels). At one point I stopped to get ready for the flight: took off my scarf and winter coat and squished it into the wheelie suitcase, and unbundled Niko squishing his excess stuff into our two carry ons. A woman and her daughter were curiously looking over at me and smiling, and all I could think to say was: “It’s a real process, that’s for sure”! They smiled and reassured me saying that I made it look easy. I am not sure what looks so easy about being laden down with so many items, but this is just what they said, and it was a small moment of glory for me! 2) The other day when we went skating on the Rideau Canal with Lena and Heather, I ran into another mom in the parking lot who was bringing her daughter skating. Our cars were parked beside each other and it took us a good ten or fifteen minutes to go from simply parking the car to start wheeling toward the canal. As we both bustled about, taking care of baby business, I caught her eye and said, “It’s a real process getting out like this, hey”? And mid parking lot, snowsuit change of her daughter, she looked up at me smiled, laughed and agreed! 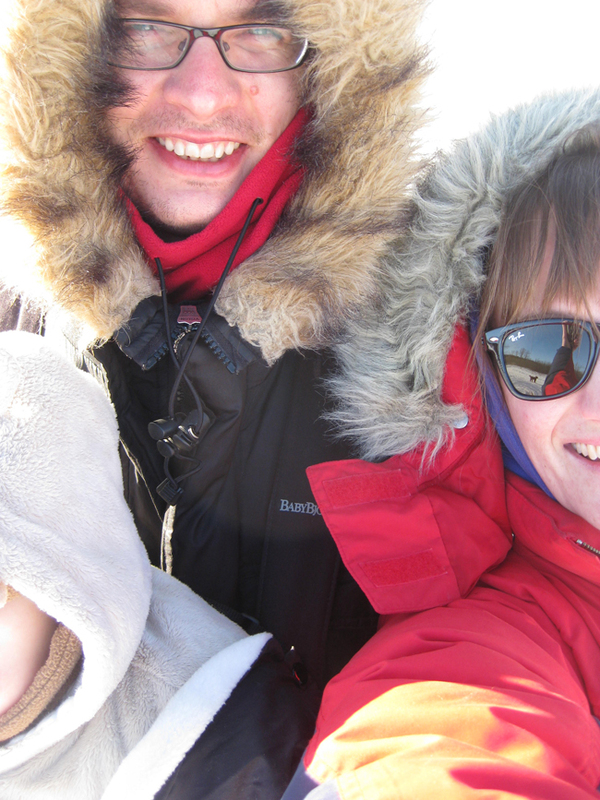 So, having a baby and getting him from point A to B can be a challenge and is definitely a process with all the cumbersome extras that come along with our delightful winter outings. But beyond winter, whether it’s bathing him, getting him into the car seat, strapping him into the Baby Bjorn, preparing him for the stroller, readying him for swimming lessons, whatever it is, it seems to take a lot of time, preparation and patience! 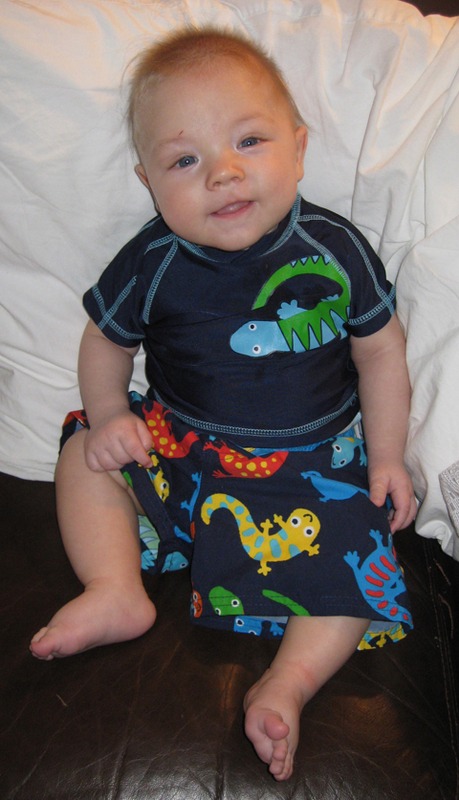 1) Get the diaper bag ready while Niko is sleeping: zip it shut and put it by the door. 2) Put my scarf and winter coat on before I bundle him. Niko usually puts up a fuss when I get him ready, so the quicker I can bundle him and get him out the door the better. 4) If going out in the Baby Bjorn, secure it on me before I begin to bundle Baby N.
5) Take a deep breath. Give myself enough time. See the humour in things, and try to enjoy ALL the moments, even the crying ones (that’s the baby crying, not me 🙂 ), because before I know it, I’ll be back at work and he’ll be getting bundled by the babysitter. It’s winter. We live in a second floor condo. We have a one year old standard poodle named Frasier. He has lots of energy. This combination of factors would usually be a recipe for a pretty rambunctious puppy, but I think all in all Frasier is a wonderful pooch and overall very well behaved. Seeing as we don’t have a yard at our current abode, I try to get him out with Niko for at least one good run/walk during the day. Last Sunday, Borys, Niko, Frasier and I (me and my boys 🙂 ) braved the February elements and headed out to one of the few off leash dog trails in Ottawa: all in all it is a great place to get some fresh air and walk the dog within the city limits. Even though just a few days ago I said that the temperatures had been milder, I guess the overall mid. February weather is a bit unpredictable. 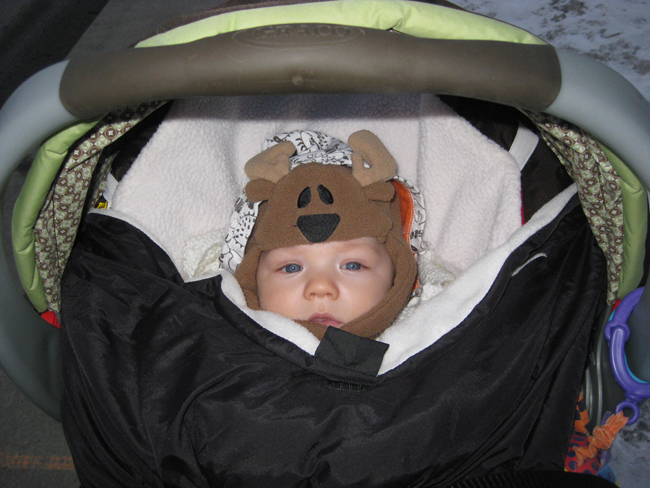 I mean the day was sunny enough, but once we got there we realized it may be a bit too cold for our little man. The city grooms the pathways at the park, and at first we thought it would be a good idea to trek baby N along in his stroller: so we strapped him in and started rolling, only to discover that despite the plowing this was not going to work out – his head was bobbing around like a buoy on the rough seas, hence plan two was put into action. We bundled him up and strapped the Baby Bjorn onto Daddy. Usually it takes us a good 45 minutes walk the trails, and depending on what paths you take it could even take longer. However, in the middle of February with a baby whose nose was getting progressively more red, we were forced to cut our walk short and only stayed for about 15 minutes! Oh well, at least Frasier got to say hello to a few of his puppy friends. Note: Picture 1 – The Beauty of Self Portraits (with Frasier reflected in my sunglasses). Picture 2 – Boyz in their Hoodz. Quite a few years back, when my sister Marion had only one child, she and her fam – including my mom – came to Ottawa for a weekend of Winterlude. 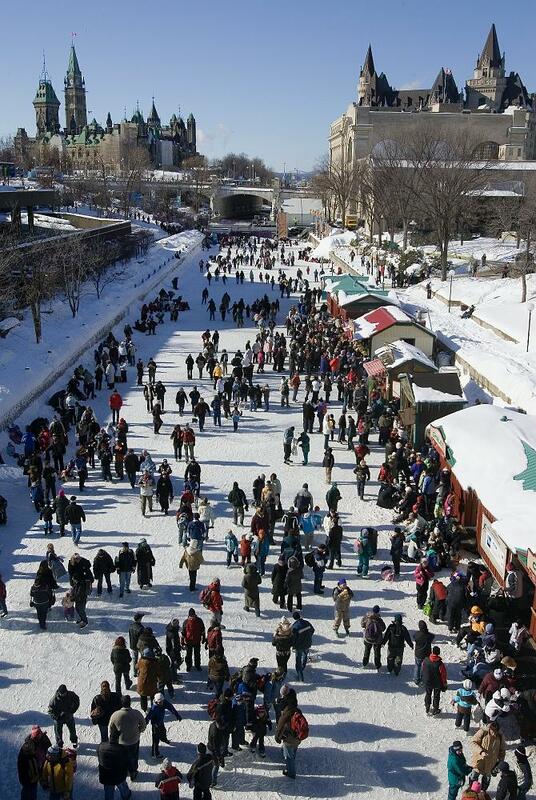 Now, if someone comes up for Winterlude it is imperative that they make the trek to the Rideau Canal – the world’s largest outdoor skating rink – don a pair of skates and make a go of the somewhat bumpy surface. Seeing as Audra was just a wee babe, she remained snugly in her stroller while Marion and John Paul took turns pushing her on their skates down the canal. And seeing as they were here on a weekend, the canal was probably as jam packed as the accompanying picture shows. Anyway, we had a great time skating: well most of us did. At one point I looked over my shoulder to check on my sis only to see that she had taken a spill with wee Audra! Yes, picture a three wheel stroller down for the count! Basically Audra was left looking skyward and the stroller had been tipped and landed by the time I saw it: I can only imagine how easy this would actually be to do, while pushing a stroller in ice skates! Thankfully everyone was OK, and we just righted the stroller and continued on our trek down the canal and back again. By the time we made our loop and were seated on the side, putting on our shoes I came to realize that mysteriously one of my shoes had disappeared! Well maybe not so mysteriously, seeing as they were camping out in the base of the stroller: that was until the stroller tipped I am sure! So, I was left with only one shoe in the middle of winter and we still had to walk back to my apartment on Stewart St. – a good 15-20 minute jaunt. “I saw your shoe way down there!”, said one onlooker when he realized that I was wearing only one! But we figured that shoe was a lost cause – the stroller had tipped probably over an hour ago and who’s to say where that shoe could have been shuffled off to. Marion had the innovative idea of me donning a diaper over my sock, and then a plastic bag to boot! And I did! What a sight my footwear made for the walk home – just following my ever handy advice of fashion before comfort! Little Niko, Baby Lena, Heather and I are planning to make the trek down to the canal sometime this week – weather pending. Winterlude has started and I am ready for a Beaver Tail! 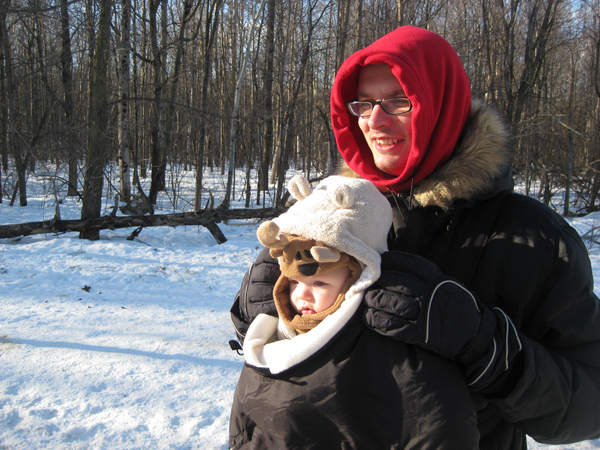 As I reminisce about the lovely day – baby tipping and shoeless – I spent enjoying the Ottawa winter about 10 years ago, I will remember to be vigilant of my weight distribution as I push Niko’s stroller! Afterall, even though Audra survived sans a scratch on her, ideally this is not the way I want Niko’s first canal experience to end up! Well, I know it’s been a while since the solstice occurred, but we are finally starting to reap the benefits: and by we I mean, Niko, Frasier and I, but mostly Frasier! We have had a few warmer (and by warmer I mean -4 to -12 degrees) days this week, which means I can actually bundle up baby N and take him out and about in his stroller, with Frasier tagging along. For the last two days we have gone for two 45 minutes walks. 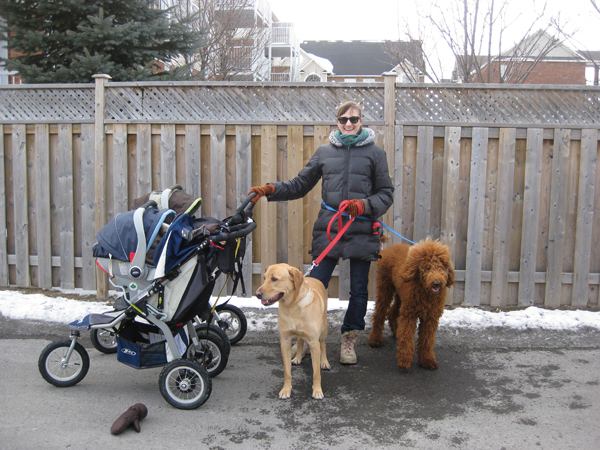 I used to find it pretty challenging to walk with both of them at the same time, until I discovered that the best way to walk Frasier is to tie his leash around my waist, which leaves both of my hands free for the stroller. I can only imagine what my entourage and I must look like coming down the sidewalk! 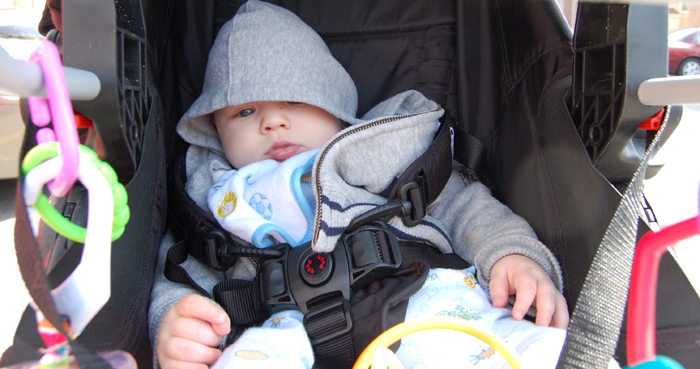 In the past, when I had the leash wrapped around one hand and both hands on the stroller, I came in to a few, let’s just say tricky, situations: if Frasier ever decided to give a good pull – hello stroller wheelie! Yes, that move forced Niko to become an extreme strollerist, at the tender age of just a few months, cruising along on just two wheels! Anyway, the longer days and warmer temps are proving great for all of us – Niko gets fresh air, Frasier exerts some of his endless energy, and I get to do both! 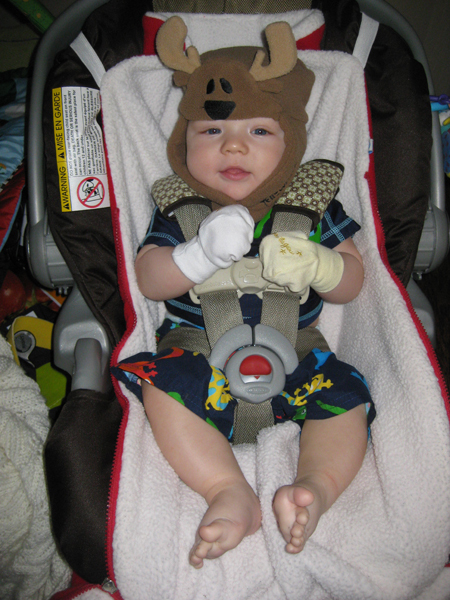 Note: Check out the carseat cover, sans dancing ballerina bears.